Mellington Hall Touring & Camping Park01588 620056work Holiday, Touring & Camping ParkMellington Hall Country House Hotel is a Grade II Listed 19th Century house set in beautiful landscaped grounds with spectacular views in every direction. The Touring Park is set in these grounds. Offa’s Dyke Footpath passes through...there are woodland walks...ponds and streams...and wonderful countryside all around. 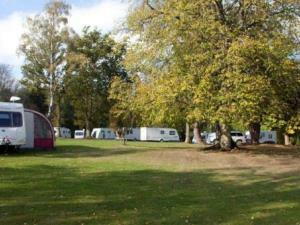 We have 30 touring pitches with late arrivals pitch. Each pitch is equipped with Euro Bollards giving electricity, nine channels of satellite television, and water. Mellington Hall Country House Hotel is a Grade II Listed 19th Century house set in beautiful landscaped grounds with spectacular views in every direction. The Touring Park is set in these grounds. Offa’s Dyke Footpath passes through...there are woodland walks...ponds and streams...and wonderful countryside all around. Touring caravan on hardstanding pitch, to include 2 adults and 2 children, satellite TV, electric, water and awning – £25 per night. No charge for well behaved dogs. Extra adults £6 per person per night. Camping: From £7.50 per person per night for small one man tent.